If you are one of the 87 million that are afflicted with snoring, fortunately, it is possible to find an effective snoring remedy. However, although there are a lot of snoring remedies out there to choose from, it doesn’t mean that they will all help. But by combining a snoring mouthpiece or sleep apnoea mouthpiece with a plan to lose weight, this allows immediate relief from the mouthpiece, and long-term relief through the loss of weight. This is a method that truly targets the issue at its root. Being overweight increases neck size and results in excess tissue blocking the airway. A weight loss program can reduce the excess tissue in the neck area and decrease the severity of snoring and/or sleep apnoea. Plus the mouthpiece is essential in providing the ultimate immediate relief sought out. 3. Using a snoring pillow (snore pillows can help position the head and neck in an ideal position to reduce snoring but work best when combined with a snoring mouthpiece since it is not possible to stay in the same sleeping position throughout the night). Snoring is not only annoying for your partner but may also be a sign of an underlying issue, sleep apnoea. 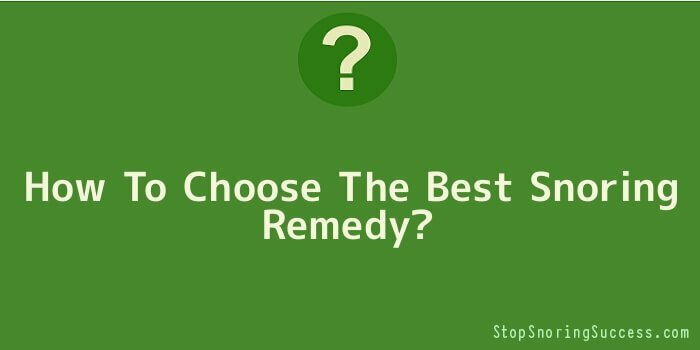 When it comes to home remedies, they may be simple and inexpensive, but the ineffectiveness could be the least of your problems through time. Finding the best snoring remedy is essential for targeting the issue effectively. Many home remedies may quiet down the snoring and lessen the annoyance, but the underlying issues can be negatively affected by some home remedies. With some home remedies causing further obstruction of the respiratory system, there can be a drastic consequence for those suffering from sleep apnoea that are not aware of the condition. Sleep apnoea is a highly undiagnosed condition that is many times the cause of snoring and can be life-threatening in some cases. Using an adjustable anti snoring mouthpiece customized for your unique bite (jaw position), breathing habits and jaw joint function will ensure that you are able to effectively eliminate even the loudest snoring, while effectively controlling sleep apnoea as well. These two key benefits are why a customized, adjustable snoring mouthpiece is the best snoring remedy.